Tairāwhiti Multicultural Council asked local body candidates five questions. They seem to have liked my responses! 1.What is your vision for Gisborne in terms of cultural diversity? That all Gisborne people can feel proud of their unique cultural heritage and honoured for the diversity they bring to our community. Gisborne could show other regions how to support the exchange and sharing of diverse cultural backgrounds in a way that enriches our town. 2. 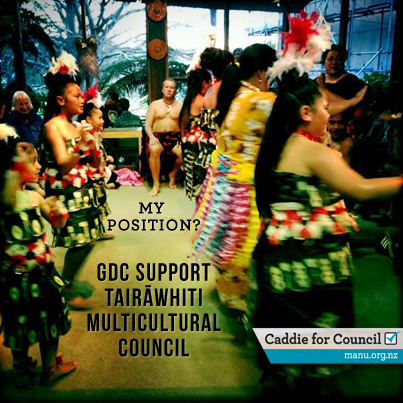 The Ten Year Plan says GDC will support the development of cultural groups in the district, what kind of support do you think GDC should provide to the Tairāwhiti Multicultural Council? As part of GDC cultural responsiveness it could utilise the TMC to be a liaison network with community. GDC would then benefit from investing in the Council by providing administration support and resources. The Council could discuss further with GDC how it might like to have input into Council discussions. 3. What regular interaction do you have with groups of people from cultural backgrounds different to your own? I have worked on aid and development programmes in Asia, Africa and the South Pacific but most of my work has been here in Gisborne and mostly within the Māori community. While I have Tongan whakapapa, my upbringing was pretty middle-class Pākehā – though I did spend a lot of time at marae, in hui and kapahaka as a child. 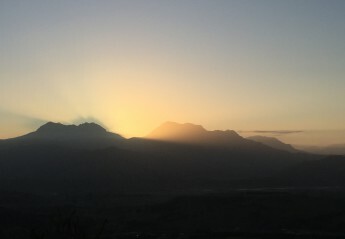 Marrying a woman from Ngāti Porou and coming to live here has meant I have a direct family connection to mana whenua and have immersed myself in the culture of Māori communities both in Gisborne and on the Coast where we are intimately involved with a whānau marae. My wife and I have only ever spoken Te Reo Māori to our children and we’re committed to them being educated and socialised in Te Reo as well as the exposure they have everywhere to English. So we understand something of the struggle people from minority linguistic, religious and ethnic communities have to endure in this Anglo-Saxon dominated society. I have been a founding member of the Tairāwhiti Inter-Faith Network and more recently the Tairāwhiti Multicultural Council – both are small but important networks that encourage people from diverse backgrounds to come together for the common good. I’m regularly invited to Tongan and Pacific Island community events and recently participated in discussions around the establishment of a local consortium of Pasifika peoples focused on Whānau Ora initiatives for Tairāwhiti. I have supported migrants with immigration issues and negotiated on their behalf with immigration officials and lawyers. I have helped organise multicultural community events that bring people from diverse cultural backgrounds together in our neighbourhoods. 4. What, if any, common challenges are you aware of for local residents from ethnic minority groups? Negative stereotypes are still around. Such unfair stereotyping of any group can detract from the community as a whole being able to draw from the energy and contributions a group can make. There are still some groups over-represented in crime and educational failure and under-represented in business leadership and educational success. Initiatives like the Tongan Homework Support Programme utilising local volunteers and working with the students while the parents learn English at EIT is an exciting community-based response to do something about this situation. Some particularly new to New Zealand arrivals can often feel isolated so strengthening community connections for those families is important. Also there needs to be support for ethnic minority groups to be able to feel that they have a home in our city and can adapt in ways that are useful to them, while also maintaining their own culture. 5. What are the biggest opportunities you see for attracting new immigrants and refugees to Gisborne? As a city if we genuinely aspire towards sustainable solutions to the challenges that ethnic minorities face, this may attract their talents to our region. There are opportunities to ask the Government to consider resettling some refugees here as they settled Burmese refugees in Nelson ten years ago. There are also a number of local businesses that rely on migrant workers – not only in low-skilled horticultural work but high tech positions like computer programming and materials technology. I met a PhD from Bangladesh who was working at Pultron and subsequently head-hunted by a company in Melbourne – he had some awesome ideas about developing composite materials from flax fibre here. If Gisborne can show that it celebrates diversity and wants to involve ethnic groups in meaningful discussions on relevant issues – this would enhance the decision making process of GDC.